Tonight we are putting on a new spin on the traditional Italian dish chicken parm. This version isn't Italian at all! We thought we would add some Mexican flair to give this dish a whole new look and MUCHO flavor! 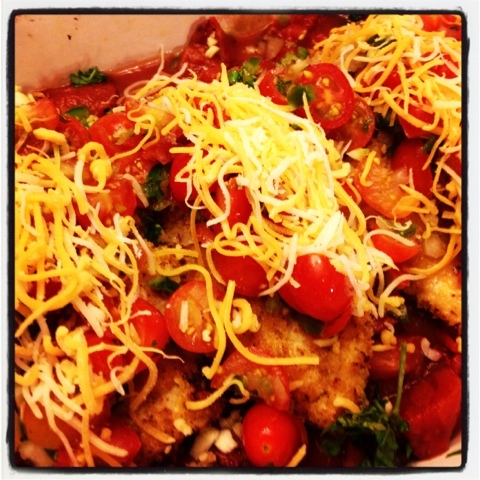 Our Pico de Gallo Baked Mexi-Chicken Parm is a delicious and healthy dish you can feel good about serving your family! We started off by baking (the word fry is not in our vocabulary) our chicken with whole wheat panko mixed with cumin, chili powder and cayenne pepper to spice things up. This alone adds a whole new layer of fun and gets your taste buds wanting more! Our next layer of flavor comes from our delicious pico de gallo! As we have said one of our favorite things to snack on is fresh homeade salsa, so we thought why not turn this snack food into the star in our main dish! 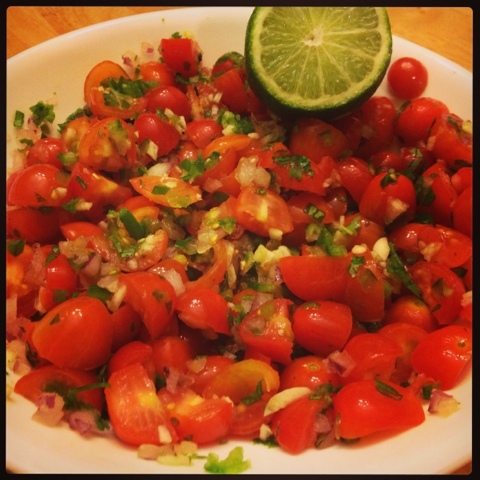 We chopped up cherry tomatoes, red onion, garlic, jalapeno, fresh cilantro and topped it off with freshy squeezed lime juice! This was our 'sauce' in our Mexi-chicken parm! If you're short on time feel free to take a little help from the store and simply buy a jar of salsa at your local grocer. 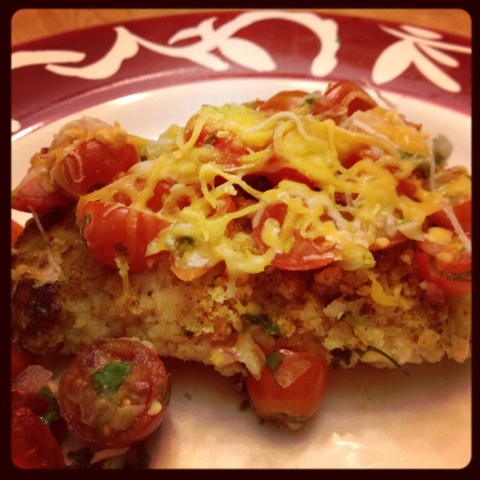 Lastly we topped each individual chicken breast with one tablespoon of reduced-fat mexican cheese! Trust us this is more than enough to get that cheesy sensation and still keep the calorie count at an all time low. We baked this dish in the oven and it turned out golden brown and delicious. This flavor combination is one you will certainly have to try for yourself! Hope you enjoy this healthy and delcious dish! 2. Beat egg white and skim milk together to make egg wash. Mix bread crumbs, mexican spices, 2 minced garlic cloves and 1/2 minced jalapeno together. 3. 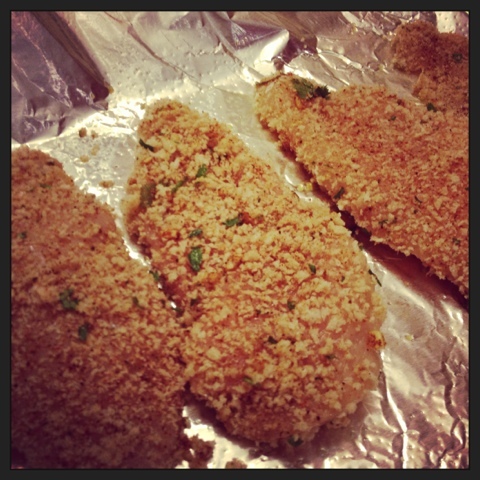 Coat chicken in egg wash then panko mixture and place on a baking sheet. Make sure to spray baking sheet with non-stick spray to prevent sticking. 5. Grab baking dish and layer in the can of roasted tomatoes. Season the tomatoes with the remaining minced garlic and jalapeno. 7. Bake for an additional ten minutes at 400 degrees then broil for 1-2 minutes until cheese starts to brown and bubble.